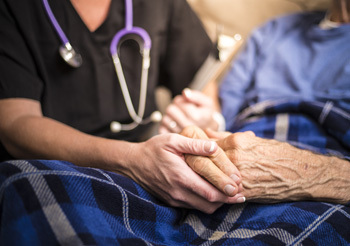 Hospice care is not something most people want to talk about, but it’s a topic that needs to be discussed to better understand the many benefits and also dispel any misconceptions. Hospice care is a set of specialty care services that assist individuals who have a life-limiting or terminal illness, as well as their families. The care provided includes medical, emotional, spiritual and grief support. Often, when hospice is first suggested, the patient or the family is hesitant to accept it because they don’t fully understand what it entails. Usually, those who do receive it say they wish they had accepted the care sooner, because they had no idea how much help it could be. Medical care from registered nurses trained in pain control and symptom management. Personal care needs such as feeding, bathing, shaving, etc. Emotional support from social workers who can help manage emotional aspects of late-stage illness. Spiritual care is offered by chaplains who are professional clergy. Companionship from volunteers. They will come by to play cards, read to you, take a walk or just sit and talk over a cup of coffee with you. Grief support from grief specialists who can offer one-on-one visits, phone calls and literature to family members for as long as 13 months. Hospice does not have to be a brick-and-mortar location where you send people. This care is offered at a patient’s home, a facility or in the hospital. It can be tailored to the individual needs of a patient and their family. One mistaken belief is that hospice care is only for cancer patients, but this is not true. Anyone, from infants to the elderly, who are suffering from a life-limiting and/or terminal illness can benefit. Most patients and families who begin hospice care as soon as possible find that it helps ease the burden significantly. It’s also important to know hospice services, including medication and equipment that may be needed because of the patient’s diagnosis, are completely covered under the Medicare/Medicaid. Most private insurance carriers also offer a hospice benefit. Those who are hesitant to discuss hospice care often fear that if they begin talking about it or decide to start, then that means they have given up or have no hope. It isn’t a matter of giving up, but rather providing the best possible life during the time the patient has left. Many people in hospice care enjoy a better quality of life. If you or a loved one are facing a terminal illness diagnosis, speak to someone about how hospice care may be able to help.